Some days back I published an article about SQL Injection. In this article very small discussion about .htaccess file. After lots of requests I publish this article to add more security to your php application using .htaccess file. In this tutorial I want to explain about hiding .php extensions and URL rewriting. So improve your Web projects security and quality. Very simple open any editor like notepad just file save as into .htaccess with in double quotations(".htacess"). 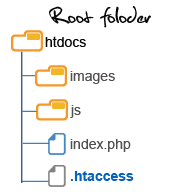 You have to upload this file in to hosting root folder, my experience .htaccess file supports only Unix based servers. If you type www.twitter.com in browser it will be redirected to twitter.com. My twitter profile http://twitter.com/foxscan its original link passing GET values (http://twitter.com/profile.php?username=foxscan) but this URL is ugly in browser address bar, For user friendly we can change like this. If any suggestions post a Comment. Good but you should put it in to the apacheconf for speed the .htaccess gets read each request and must be parsed each time. I am curious how this method improves security? It makes for a cleaner application, but does not make your application any safer. I suppose in some ways masking what file extension you're using, thereby masking what language you're using, helps to throw would-be attackers off your tracks. I agree though, these are just general tips and tricks. A good read for sure, but not a lot to do with security. 500 internal server It's not your fault. If u upload or delete .htaccess or any server files more times 5 times this 500 page will appear. Solution : Immediately take back-up and delete all the files in server (no subfolders in htdocs) and freshly upload. I tried your tutorial in many way, but no luck I could not pass it through. Still having problem with the pretty url. Can you help me out this below url to clean url please. dont need using rewrite to change the extension of php or any extension to other ext. I use such type of file extensions like index.php , admissions.php etc on the server. But i want to display in url as index/ and admissions/ etc. And when user type index.php then error comes page not found. Plz give reply as soon as possible. if there is folder calld "image" in my main folder how i use this? if i create username called "image" how i ignore image folder? Thanks for the tutorial on htaccess file.. I am download .htaccess file and put in my directory where i take my project but i don't re-write my file url please help me!!! Can you please tell me about how it work on localhost. But I want to ask that the field in url 'username' is it database field? i am still confuse ...about the passing variable with URL without its name...only value i want to display.. Please maintain the base URL for CSS. I noticed that when I used the code, all the other pages on the website could not appear. Any help on limiting this to only the profile page whilst other pages can be displayed as well?